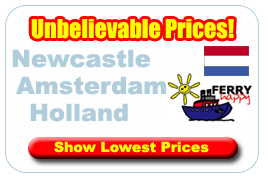 We will help you to find the best deal online for your Ferry from Newcastle to Amsterdam from a selection of some of the very best ferry companies. The Newcastle to Amsterdam Ferry crossing is a pleasant, convenient way to get to Amsterdam. The ferry crossing runs daily, overnight - so you can get a good nights sleep while you sail! The Ferry to Amsterdam leaves Newcastle port at 17:00 and after an overnight crossing arrives in Amsterdam at around 09:30 dutch time. On the return journey the Amsterdam to Newcastle Ferry departs from Amsterdam at 17:30 local time and arrives in Newcastle at 09:00 the following day. The only direct Ferries to Amsterdam are with DFDS Seaways which depart from Newcastle in the north east of England. Other ferry crossings from Hull to Amsterdam (mini cruise) (P&O Ferries) & Harwich (Stena Line) would be better suited to persons travelling from other areas of the UK. Probably a little too far for day trips Amsterdam is hugely popular when it comes to short city breaks and maybe a starting point for longer holidays. Whatever any visit to Holland's most cultural & historic city will probably involve a short ferry crossing. Departing from the Newcastle Ferry Terminal DFDS Seaways provide 15 hour overnight crossings each and every day to the port of Amsterdam. Newcastle's port is easyily accessable by car from the city centre by following signpost's for the coast and then at the Tyne Tunnel follow signs for the Royal Quays. Follow the A19 from the north and south to the Tyne Tunnel. Signpost's at the northern roundabout will direct you to the port. Trains on the east coast line connect to Newcastle's Central Station. Coach service's connect to the ferry terminal several hours before each departure. DFDS Seaways will provide a coach service at the other end of your crossing taking passengers to Amsterdam's city centre. The city Amsterdam is the capital of the Holland, its name deriving from "Amstel dam" pointing to the city's origin that being a dam on the river Amstel. Amsterdam was founded in the late 12th century as a small fishing village which grew to become the largest city in the Netherlands. Amsterdam is known for its vast array of canals with elegant canal houses leading Amsterdam to being called the "Venice of the North". This beautiful city has a rich, historic and diverse cultural heritage. Amsterdam's Tourist attractions include the Rijks museum, which features a magnificent selection of Dutch paintings from the Golden Age, the Anne Frank House where Anne Frank wrote her famous diary during World War II and Artis Zoo, the oldest Zoo in Holland. The city centre of Amsterdam is only 30 minutes away by bus from the Felison Terminal Cruise Berth in IJmuiden where DFDS Seaways ferries dock.